Home Performance is an area of building science that focuses on creating a comprehensive solution to fixing comfort and energy efficiency problems in a home, or examining the building envelope for a new home that prevents these issues during the construction process. True North will work with your architecture firm, contractor and energy auditor (we recommend Evergreen Home Performance if you are looking for energy auditing and insulation services) to ensure your home stays comfortable year-round in the most efficient way possible. 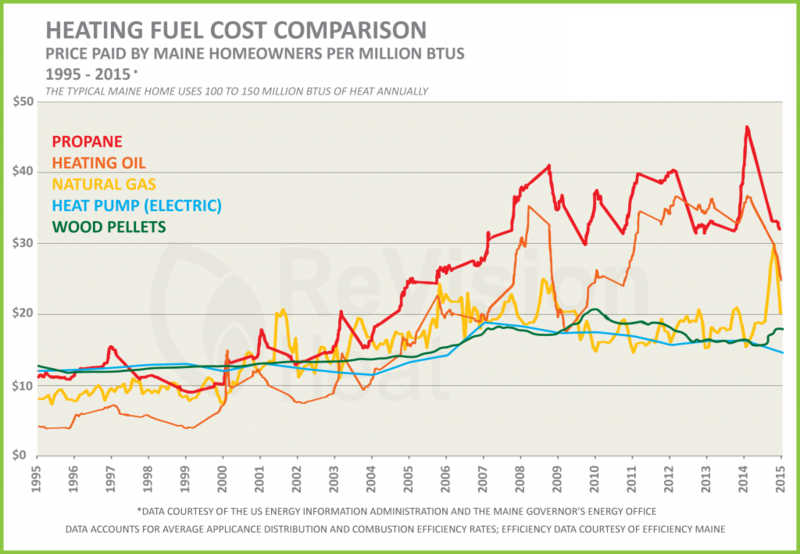 When building a new home or renovating your existing home, you will want to consider the heating fuel to which your home will be tied for the lifetime of your appliance, which can be 30 years or more in some cases. With economists predicting the prices of fossil fuels to remain volatile and somewhat unpredictable in the future, it makes sense to consider alternative fuels like wood pellets, cord wood, biofuel or efficient electric heat, as well as implementing smart solutions such as energy recovery ventilators and smart controls. Check our fuel comparison chart below for a historical look at fuel prices over the last 20 years. Then get started today! Contact us to schedule an in-home visit with one of our Energy Auditors, who will guide you through the process of moving forward with your dream home. Get Started Today! Tell us about your dream home and we’ll help you determine the best heating solution for you.